Best ball fantasy football has plenty of virtues, especially for those that love drafting above all else. For all of those virtues, though, a lot of it isn’t that different from our season-long leagues. The top of the draft in particular. Sure, we can nitpick whether the guy who is the No. 1 receiver in season-long is the No. 1 in best ball, but it’s not like a guy is going to be first in one and 32nd in the other. It’s a variance of one or two spots at that level. It’s down lower where things get more interesting for best ball, and thus more important to parse differences for those playing. With that in mind, we’re taking a look at positional sleepers in the best ball game, players who it might make sense to pounce on later in the draft, but earlier than you might be interested in them in redraft leagues. We’ll be back around next week with a look at potential busts. Today, quarterbacks. One thing to remember about quarterbacks — “sleeper” is a tough designation. There’s no sense in recommending, say, Ryan Tannehill as a sleeper. Even if he has a starting job next year (and that seems unlikely), he’s still only a last-ditch option. Some of these names aren’t true sleepers so much as they are slightly underrated for the best ball game. Mayfield might lose his “sleeper” status in short order as drafts progress over the next few weeks now that Odell Beckham Jr. is in the fold, but there will still be plenty of “prove it” types out there that I think there’s a chance he’ll present potential value all offseason long. Mayfield put up five games of 20-plus fantasy points in 13 starts last year, including three of six after the team’s Week 11 bye. Give him a full offseason as the starter, a new coaching staff that is planning for him specifically, and new weapons that include Beckham and potentially Kareem Hunt when available, and Mayfield has near-the-top-of-the-position upside in a given week. 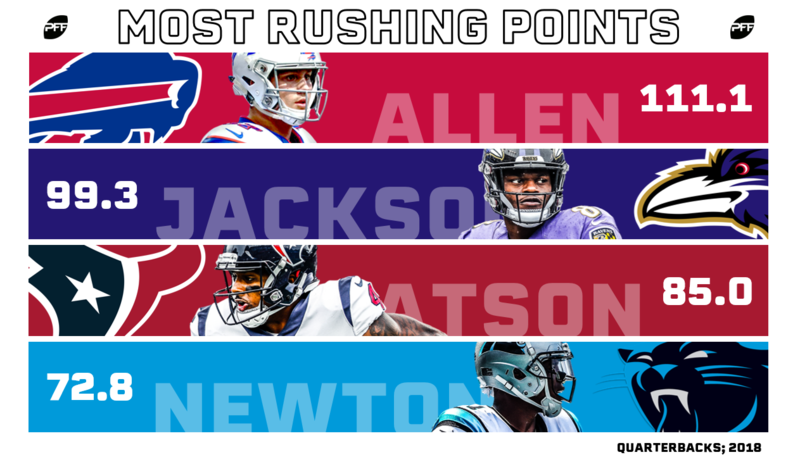 As I noted in my recent piece on bad picks for best ball leagues, quarterbacks without rushing chops just don’t help you that much in best ball. Sure, Drew Brees and Matt Ryan — guys at the top of the food chain — do fine, but the next tier — Philip Rivers and company — just don’t have the ceilings you want in best ball. Runners, though, like Allen and (in particular) Jackson last year, have the extra avenue to production that you want. And Allen now has both Robert Foster and John Brown on his roster, giving him deep specialists who add that layer to best ball production. Jackson might lack those types (for now at least), but he was such an extreme runner last year that it only takes one or two decent pass plays for him to become a monster fantasy option in a given game. Quarterbacks who have at least one 30-point fantasy game each of the last two years: Deshaun Watson. Ben Roethlisberger. Derek Carr. That’s the whole list, believe it or not. And while Watson and Roethlisberger are good for good games throughout their seasons, Carr has been far more boom-or-bust. Take out his biggest game each year, and his full-season fantasy points-per-game average drops by more than a point (14.8 to 13.7 in 2017; 14.9 to 13.8 in 2018). Give Carr the best receiver he’s ever had (the best receiver most quarterbacks have ever had, really) in Antonio Brown, plus fellow boom-or-bust option in receiver Tyrell Williams, take away any “names” at running back (the position is currently barren), and maybe Carr adds a few more shootout games and can put up a few more big performances. He’s not someone you want to rely on all year, but as a second or third best ball quarterback, he’ll give you a few games you really like. The main thing we know about Darnold after his rookie season is that we don’t actually know much. He was legitimately terrible for a good chunk of the year, then was PFF’s No. 2-graded quarterback (both overall and as a passer) over the season’s last month. He was the youngest Week 1 starting quarterback ever and had monster stock entering last year’s draft, but topped 300 passing yards only twice and threw for more than one touchdown five times. And he did all that with maybe the worst overall supporting cast in the league. So far this offseason, the Jets have added Le’Veon Bell and Jamison Crowder, with the possibility of more to come. 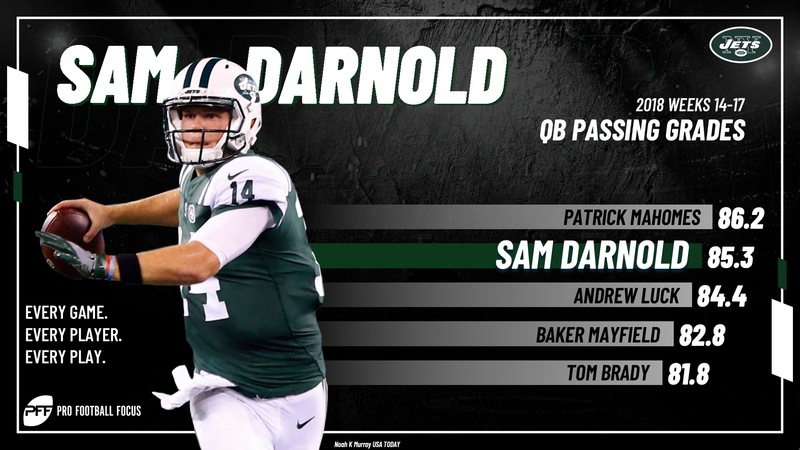 If Darnold is the guy he was over the last month, he could be a monster in 2019. If he is the guy he was for a big chunk of the year before that, he might not have much to offer. He’s a best ball wild card.